Employment Handbooks, policies and procedures are great tools for running a business. At the Law Office of Kenneth Carp we know that unemployment compensation benefits can be paid to discharged employees (called claimants) who violate known rules. Kenneth Carp knows the law and more importantly how the law is applied. Handbooks and written policies are great evidence at an unemployment hearing but they are not enough to have a judge deny the payment of unemployment benefits. Our representatives have been representing employers for years and know the value of written and known policies and procedures in running a profitable business. When employees know what is expected of them business runs more smoothly. However, an employee (called claimant) will not be denied unemployment benefits just because they violated a term in an employment handbook.Kenneth Carp knows how to present the evidence of the employment handbook in the context of what the law requires for the denial of benefits. A simple illustration is the violation of a drug policy contained in an employment handbook. In Missouri, for example, the employer must show specific evidence regarding the testing procedure including chain of custody, a confirmation test was offered and Department of Transportation (DOT) certification of the testing facility. Contact Kenneth Carp at 636-947-3600 to learn about the service we can provide to review an Employment Handbook from the perspective of unemployment compensation benefits. The law Office of Kenneth Carp can offers the service of teaching you about discharging employees before the discharge. Controlling your unemployment tax dollars involves discharging employees in a manner consistent with a denial of unemployment benefits. The same is true with accepting resignations or quits in a manner which prevents the payment of unemployment compensation. The violation of a known policy is not a guaranteed win at an unemployment hearing. A common misconception is that the documentation of policy violations regarding absences or late call-ins will result in a denial of benefits. However, employers who are unprepared routinely lose these unemployment hearings. Your policy may be a “no-fault” policy but the judge applies a different standard when determining if unemployment compensation should be denied. Statutory and case law allows for the payment of unemployment benefits even if you have known policies and procedures in place. Our representatives knows how to apply the law so unemployment benefits can be denied. 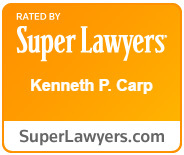 Call Kenneth Carp for experienced and affordable legal representation. Learn about our “Continuity of Care” program and put our experience to work for you. Focused on unemployment law – We represent your interests.